"All Your Games are Belong to Us. The evil Game Master Arino has trapped you in the 1980's - to escape you must defeat his clasic gaming challenges. 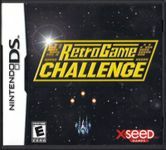 Experience a wide variety of fast-paced retro challenges, then unlock complete games for free play. Enjoy timeless 8-bit gameplay: space shooters, racing, ninja action - even epic RPG play. Search in-game magazines for cheat codes and fun articles. A winner is you!"